Rubber Boas are one of the smaller boa species, with adults anywhere from 15 to 33 inches and newborns typically 7 to 9 inches long. 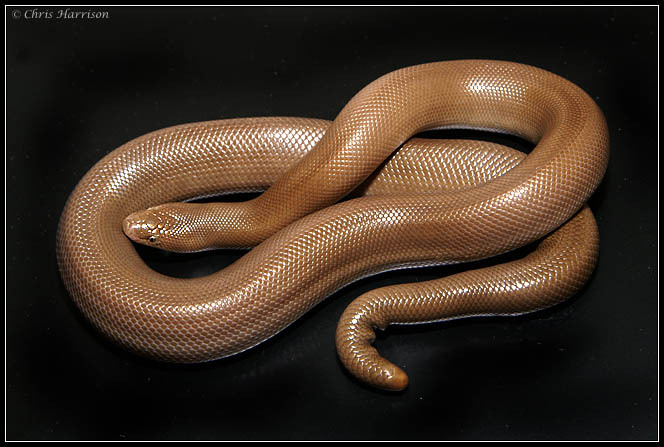 The common name is derived from their skin which is often loose and wrinkled and consists of small scales that are smooth and shiny, characteristics which give the snakes a rubber like look and texture. Coloration is usually tan to dark brown with a lighter ventral surface but sometimes olive-green, yellow, or orange. Newborns often appear pink and slightly transparent but darken with age. Rubber boas have small eyes with vertically elliptical pupils and short blunt heads that are no wider than the body. One of the most identifiable characteristics of Rubber Boas is their short blunt tails that closely resemble the shape of their head. Here you may post messages or questions pertaining to all aspects and issues regarding the keeping, breeding, health, and conservation of Rubber Boas.